Home » Blog » Awareness » How to become self-aware? Becoming self-aware is essential for self-realization. 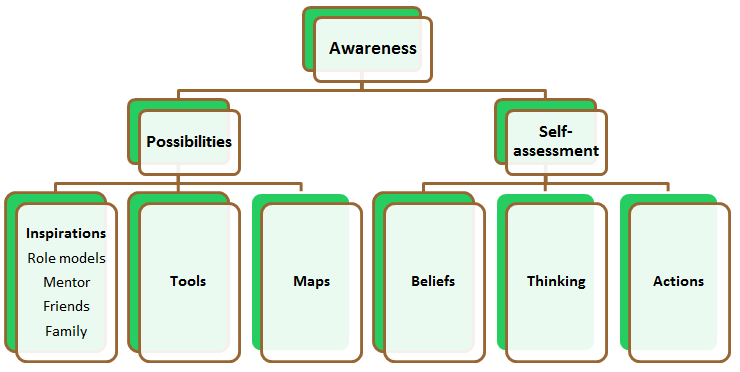 Therefore, self-awareness is the first step in the the framework of HumanBusiness. One part of becoming aware of ourselves involves getting to know the endless possibilities around us. That means becoming conscious for what happens in our environment. These possibilities can have the form of tools or maps, or be inspirational people like role models, mentors, friends, and families. Maps are a global plan or strategy like for example the roadmap of HumanBusiness. The other part consists of assessing our own actions, our way of thinking and the beliefs we have about the world. Putting what we currently do and think as well as how we see the world into relation with the possibilities presented to us can create a sense of if we are happy with our current state. It could also create the urge that we want to change things because we found other actions more appropriate, other thought styles or other ways of seeing the world more of value to us. How we are going to make a decision for the, for us, right option out of the endless opportunities will be answered in the purpose finding part. This will provide us with an orientation on what action, thinking or belief is helpful for our purpose and brings us closer to our vision. Getting to know new tools and maps as well as other people’s actions, thoughts and beliefs creates awareness for possibilities, which are different from the ones we currently know. By observing and paying attention to what is happening in our environment, we are able to create an understanding of how things work. It is like recognizing different pieces of a puzzle and being able to put them together to see the whole picture. The first reaction to new and unknown actions or thoughts or simply different behaviors from our own is resistance. That is a totally normal human reaction to protect ourselves. We simply do not adopt everything we encounter. However, if we recognize such a feeling in us, it can be the starting point to learn something new, which might be beneficial for us. We should not be afraid and instead be open minded towards the things we encounter. We can always come to the conclusion that this specific possibility is not of value to us. Then there is also nothing wrong with expressing this opinion. But why not giving it a chance and time to understand what benefit it might bring to us. In other words what could we learn from it? Curiosity plays a big role in our learning process. Think about children who are so interested in everything they encounter for the first time. They are so curious to feel, hear, see, smell or taste anything they encounter. Even though we do not have to experience our environment always with all our human senses, adapting the curiosity children naturally have can be beneficial for becoming mindful for all the possibilities around us. 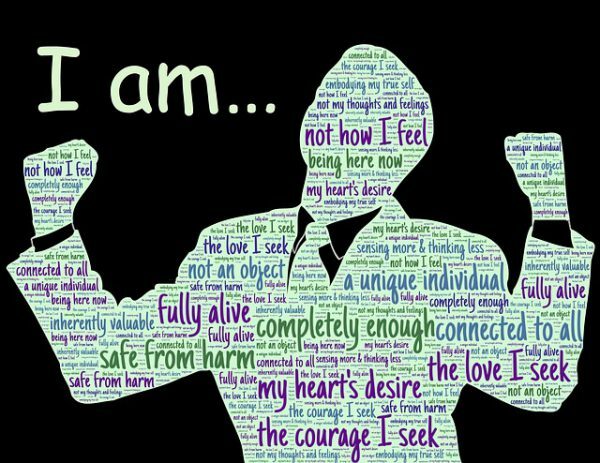 Through self-assessment we are able to consciously understand what we do, how we think and eventually find out why we perceive the world through a specific perspective. We become aware and mindful for our actions, thoughts and beliefs. Deep thought and consideration, which is how reflecting is defined, will provide us with the opportunity to become more aware of ourselves. We can reflect back on past actions, thought patterns or beliefs to identify our own motivation and the effect on other people. I cannot highlight this enough. But everything we need is already inside of us. That might sound very spiritual, but give it a second thought. We are individuals in a societal environment. If we really want to live our life to our full potential whose aims are we going to reach, which expectations are we going to fulfill? Are those the goals and expectations of our environment? Is society telling us what we can or should do and most probably telling us what we cannot do or achieve? Take a minute to reflect what do YOU want from life and I am sure you will figure out what is YOUR vision and how YOU want to design YOUR life. If you have done this, I ask you how can anybody else now be responsible for your happiness? How can anybody tell you what are the right things to do, to think or to belief? That is what I mean by saying that everything is already inside of us. So start listening to what your body, mind or heart is telling you. To be able to see the whole picture, thus becoming aware, we need to bring the possibilities presented to us as well as our understanding of what we do, how we think and what we believe together. In order to evaluate ourselves we need to have something we can compare ourselves to. That is why learning is such an important step which needs to take place first. That being said it needs to be emphasized that we should not see the possibilities and self-assessment as a two-step process but rather as a complementation of each other. It is like two sides of a coin, which cannot exist without the other. Seeing the differences as well as similarities of the effects of our own actions, thoughts and beliefs compared to those of our environment leads to either a feeling of satisfaction or the urge to change something. Change happens because why would we want to stay in a situation that does not make us happy? There are four potential scenarios we could find ourselves in, which are presented in the following table. The effect not only refers to what we do, but also to how we do it and how we make ourselves and others feel. If of our own actions, thoughts and beliefs are congruent with the possibilities of our environment we will be in a state of appreciation and happiness. We feel a sense of belonging because what we do and how we do it is mirrored in our environment. This scenario could also be seen as a comfort-zone in which the level of innovation is naturally low. So, what is so wrong about a big comfort-zone where everybody feels happy? The problem is that no more change and thus no progress will take place. That only happens outside of the comfort-zone. That is why it is important to pause and reflect if everybody is doing the same, like Mark Twain pointed out wisely. Therefore, it is also highlighted that learning should never stop during our lives. It is not wrong to have some people doing things differently from what we are used to. This scenario is based on that what we do, think or belief is not delivering results which could be observed from others. Therefore, we can look for possibilities in our environment which are of value and beneficial for our current situation and adapt them. Learn how to learn from your environment. Let me be clear, if we are doing things differently that is totally fine. But we should at least reflect ourselves and answer truly if what we are doing and how we are doing it is providing any value to us or others. We should be able to state our motivation, WHY we are doing it. If we are convinced that we know what we are doing and our environment is not responding in the way we are expecting it, than it might be time to change the environment. However, be aware that most people believe that their way is the right and only one. Sometimes we do not know everything. Okay, that is probably always the case. But we can change that with learning. We might possess some so-called blind spots, which we cannot see from our current perspective. We all have them. But only few admit them. The solution for this is to assess ourselves with reflection. The best way to spot our own blind spots is to get the perspective from another person, because they are not biased. This could be a close friend or a mentor. Reflection can also help us to change the environment. Through deep thought we can find a solution for what we can do to influence our environment in such a way that everybody profits. If we come to the conclusion that whatever we do does not have an impact on our environment then it is time to think about switching to another surrounding. The fourth scenario is probably the worst-case scenario. We are trapped in a situation where we do not know what to do and our environment is not presenting us any possibilities for improving it. However, the situation is not lost, it just requires more effort. In my opinion the most power comes from the belief that we are able to change anything when we are willing to take the first step. When we want something so badly, we are able to do un-imaginary things! This power is within us. If we find ourselves in such a scenario we need to search for possibilities even more and also outside of our current environment. We should also use our creativity to find innovative ways for improving our situation. Through innovation we can do things differently and thereby disrupt the system. To make a change, either to ourselves or our environment, it is necessary to become aware or conscious of what needs to change and how to change it. The starting point is to compare the possibilities presented with what we currently do, how we think and what we believe. Thereby we can assess what to change. Further we need to discover patterns which are holding us back from the implementation. Last but not least, we should adapt behaviors that lead to what we want. How are you becoming aware of your environment or yourself?